June 2010 - Deb Arnold, Ink. What a wacky town this is, Seattle. A wacky, hike-loving, container-gardening, Subaru-driving, farmers market-shopping, scrap-composting, recyclables-recycling, bike-riding town. Now, as it happens, this direct mail piece got me right between the eyes (see next photo, with the swirly lines). I don’t know where the best routes are in my neighborhood. I am intimidated by the hills. 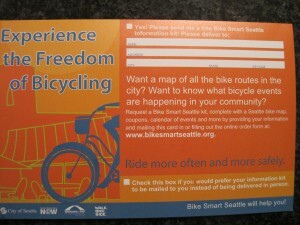 And the people at Bike Smart Seattle know that. They know who they think they’re talking to: all manner of bike sissies, who would get off their butts and onto their bikes if only they had some clue about where to go and what to do. Especially if someone would come to their house to deliver the info! Lordy, Lordy, we are not in Kansas (or Manhattan) anymore. 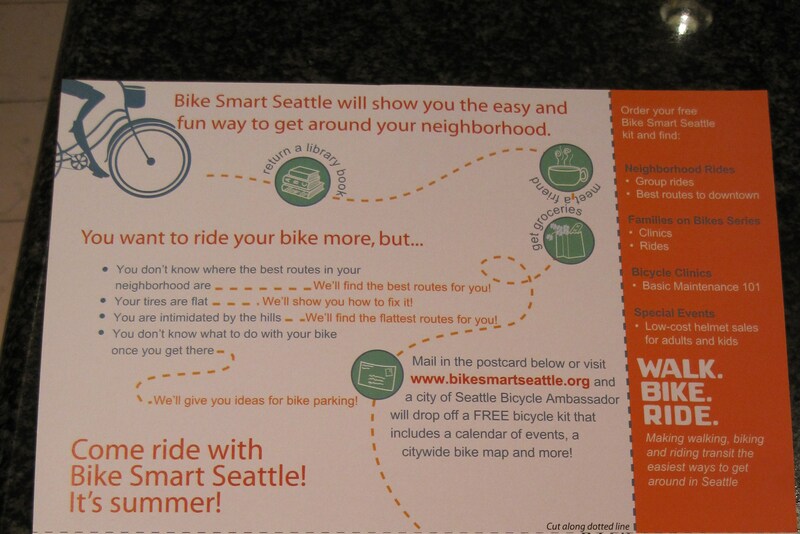 I give Bike Smart Seattle an A+. 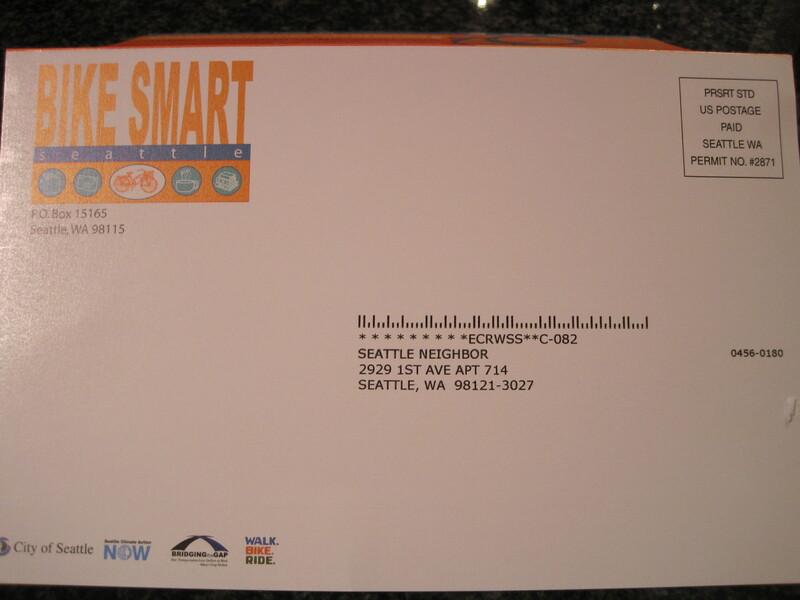 Smart indeed. 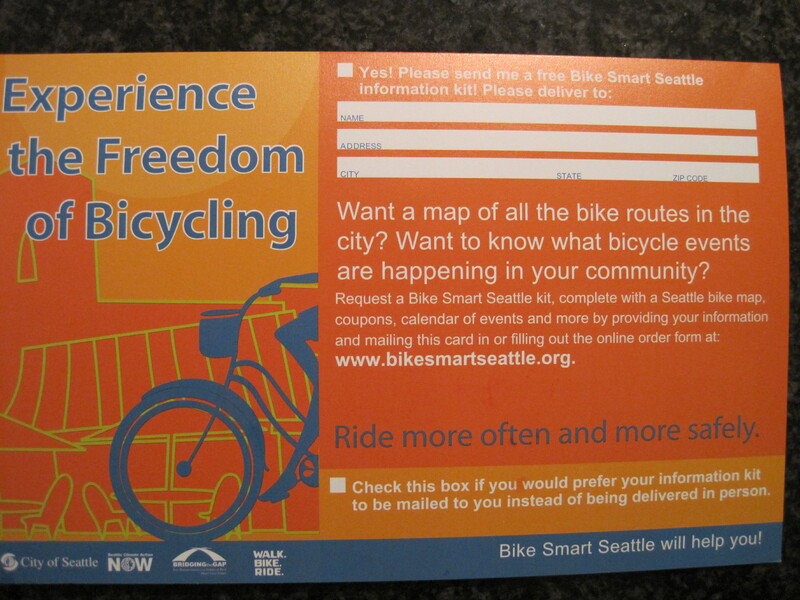 Next: Deb responds to the non-profit direct mail offer and provides her contact details in exchange for free information on bicycles (nice reminder: if you want someone to give you their contact info, be prepared to give them something in return). OK, I’m back, and I’d like to tell you that I am still pretty crazy about OneNote (and I’m still plugging it for that reason). Here’s a short demo video that describes it better than I can. I actually like this video series a lot. 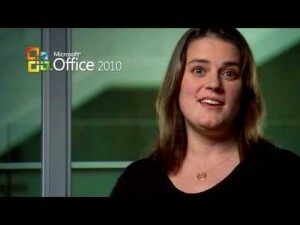 Microsoft is infamous for creating marketing that misses the mark, but this is pretty spot-on: videos featuring the folks who created the products speaking conversationally about them. What was that word again? Credible. And very human. The company suddenly looks less like a global behemoth and more like a group of seemingly normal people who are passionate about what they do.